UVI Ether Fields for Falcon www.uvi.net/ether-fields.html Journey through space-time with Simon Stockhausen as your guide. 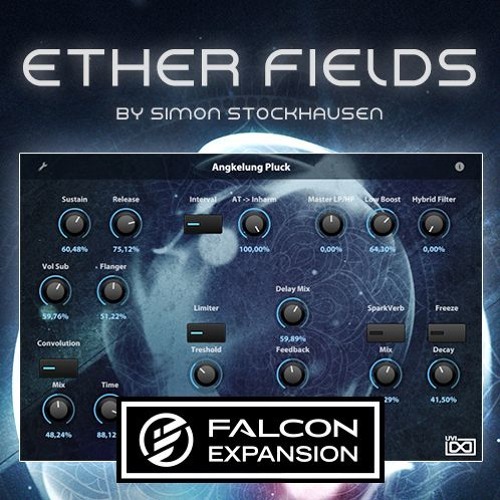 Utilizing Falcon's deep synthesis, effects and modulation capabilities, the Ether Fields expansion delivers 100 premiere patches designed to channel the timeless energy of myth and consciousness. Experience deep and atmospheric pads, lush and evolving soundscapes and haunting tones from one of the most eminent minds of sound design in this new expansion for Falcon. @auralrelics: TRIVIA: one of my favorite pieces of music EVER is ME's "Uncharted Worlds". That being said, I have a fixation with space themes like Vangelis, albeit more sci-fi than grounded in NASA. But I've definitely been influenced by SpaceX on occasion. YAY AURELICS!